To consolidate fractured user and IT infrastructures in the cloud, retire an outdated data center. Improved overall performance and efficiency, tasks automation, saved resources and efforts, cut costs. Built a modern hybrid Azure infrastructure, updated network infrastructure, simplified domain management. Retired one of the data centers with on-premises servers. Migrated 80+ servers to Azure and 6,000 users to Exchange Online and Office 365. Microsoft Azure AD Connect, Microsoft ADFS, Dell Migration Manager, Dell Notes Migrator for Exchange, Azure Site Recovery, Azure Site Recovery Configuration Server, Hyper-V with ASR Provider, Recovery Services vault for Azure, etc. 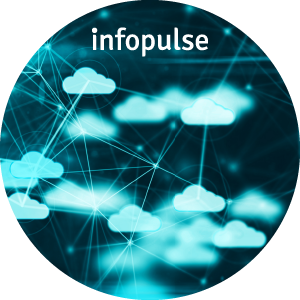 A client of Infopulse is a large multi-national provider of IT services with 40+ years of experience on the market. The company has operations in 20 countries and employs over 9,000 people worldwide. Infopulse provides a whole package of services to the client, namely managed cloud, SAP, and CRM services, development of client’s systems and applications. Our developers also help to convert .NET apps to work in Azure and develop some of the business-critical systems and applications, hosted in the cloud (PaaS). Previously, Infopulse also provided Internal IT Operations to the client. Consolidate diverse infrastructure. Due to rapid acquisition of smaller companies, user environments and infrastructure required major rework and had to be unified. Infopulse needed to migrate users from IBM Lotus and Exchange 2010 to a modern coherent system. Cut maintenance costs. Our client has a number of data centers in the EU. Some of them were in a rather poor state, while others had their rental term ending. Due to frequent failures of old hardware, our customer did not want to continue support of hundreds of outdated servers and needed to migrate them to cloud. This would allow cutting expenses on servers’ maintenance and upgrades, and improve overall performance. Technological prestige gains. Our client supplies state-of-the-art IT solutions to its customers and is on the forefront of technological innovations. Thus, moving to the cloud was a reasonable step to keep up with the latest trends. Since Microsoft provided most of the internal services and 95% of servers to our client, the customer wanted to stick to Microsoft’s stack of technologies. Being a long-term partner of Microsoft, Infopulse closely collaborates with the Redmond Giant in many areas. During the cloud migration project, we received a solid support from Microsoft. Moreover, Infopulse’s experience with Microsoft technologies has become a strong advantage in this project due to its scale and complexity. Stage 1. 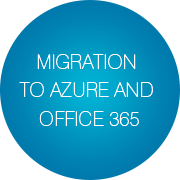 Office 365 and Exchange Online Migration (SaaS). Infopulse implemented the federation between the local Active Directory, Azure Active Directory and Office 365 services and built a hybrid Exchange Online infrastructure. We transferred users’ data (mailboxes) to Office 365 from legacy IBM Lotus and Exchange 2010 mail systems. Due to increased complexity and individual approach to each of six thousand users, the migration project took over 2 years. Microsoft Azure AD Connect, Microsoft Active Directory Federation Services, Dell Migration Manager and Dell Notes Migrator for Exchange. Stage 2. Harmonizing network infrastructure. Before migrating servers to Azure and extending the On-Premises network to Azure, we needed to prepare network infrastructure. The project was managed by a dedicated network team, which implemented Microsoft ExpressRoute service, designed and created virtual networks in Azure. Stage 3. Datacenter Migration (IaaS). The project of server migration required solid preparations from our side. First, we prepared migration environment, namely, Azure Site Recovery (ASR) and a number of On-Premises servers to support ASR migration. We needed to prepare migration documentation and describe all migration steps, sort servers based on their role and importance, and work closely with business owners of every server to make a decision for every server: which servers should be shut down, migrated to Azure or left as they are. During the initial stage, we conducted inventory assessment and made some tests; after that, we could deal with production servers. At some point, we initiate failover of the replicated server, shut down the source server and activate the destination server replica in Azure. First, we had to convert Windows 2003 server to a VMware virtual machine using VMware tool. Then, we used a Microsoft tool MVMC to convert VMware virtual machine into a Microsoft Hyper-V one. Finally, we could migrate the Hyper-V machine to Azure. Azure Site Recovery (ASR), Azure Site Recovery Configuration Server, Hyper-V server with ASR Provider, Recovery Services vault for Azure. Infopulse has built a hybrid Azure infrastructure for the client, which encompasses most of the servers and services related to Active Directory, as well as hundreds of business-critical applications. Some services, such as Active Directory, Hybrid Skype for Business and Hybrid Exchange are still managed on-premises, while most of services and servers are located at Microsoft in the cloud. By means of ExpressRoute technology, the on-premises internal network is expanded to Azure virtual networks. The IaaS datacenter migration project resulted in huge savings of resources, improved overall performance and efficiency by automating multitudes of manual tasks and allowed our customer to close one of their legacy datacenters with more than 300 servers. From now on, most of the new servers are created and hosted in the cloud, while all remaining On-Premises servers will be retired incrementally. Currently, Infopulse is working with our client on a new project to migrate another datacenter. Closed a legacy datacenter: 80+ servers migrated from On-Premises datacenter to Azure, while remaining 200+ were either retired or moved to another datacenter. Infopulse offers its clients holistic cloud transformation services and IT Infrastructure Operations. Contact us to learn more!